This is an extended version of an article entitled "Rocket Guns and Pom-Poms", which appeared in the May 1996 edition of "Military Illustrated" magazine, amended 2003 with additional information from Chris Werb and Ken Young, and further amended in 2009. Thanks to Norman Bonney for providing the illustration of the 2Pr HV "Pipsqueak" round for the latest update. 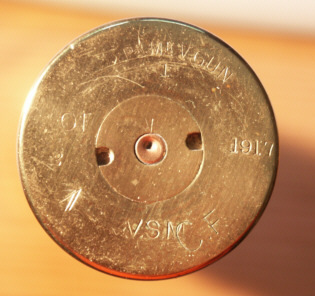 From the nineteenth century up to the end of the Second World War, 37mm was a common calibre in military service. This occurred because an international agreement, the Declaration of St Petersburg in 1868, banned explosive shells weighing less than 400 grams (just under one pound), for which 37mm was then the appropriate minimum calibre. The 37mm calibre remained popular long after its original rationale disappeared (the Declaration was effectively abandoned during WW1) and was extensively used by most combatants in both worlds wars in a wide range of weapons including tank, anti-tank, automatic anti-aircraft and aircraft-mounted guns. Even today, 37mm AA guns are still made in China by NORINCO. When armed forces wanted more performance in tank/anti-tank guns than 37mm could provide, they usually went up a category to the 47mm. This was not suited to the anti-aircraft role, however, because the technical problems of achieving the required high rate of automatic fire with such large and heavy cartridges were not satisfactorily resolved until the late 1940s. Two nations seeking better performance therefore developed and made wide use of ordnance with a marginal increase in calibre, to 40mm. These were Britain, principally with the 2 PR No.1 naval gun (two pounder = the approximate weight of the shell; sometimes written as 2 PDR), followed later by the 2 PR No.2 tank/anti-tank gun and the 40mm Class S airborne anti-tank weapon; and Sweden with the famous and apparently immortal Bofors AA gun. This article concerns the various 37mm and 40mm guns which saw service, or were planned for service, in the British armed forces. The first 37mm gun was the French Hotchkiss rotary cannon of the 1870s, inspired by the manually cranked Gatling (although using a different mechanism) which saw extensive international service, particularly in warships, but did not seem to be much favoured by the UK. The next significant development was the 1 PR Maxim "pom-pom", a belt-fed automatic weapon (basically a scaled-up Maxim machine gun) which used the same low-powered 37x94R ammunition as the Hotchkiss (see photo on right). Ammunition loadings varied but typically consisted of a 555g shell fired at a muzzle velocity of 367 m/s. This came out at the end of the 19th Century and the British first experienced it the hard way, being on the receiving end of the weapons acquired by the Boers. The gun was subsequently used by the British but suffered from the lack of an obvious role; it was too small to harm naval vessels and on land was outranged by the new quick-firing artillery pieces firing shrapnel shells, which were just as mobile. It acquired a new lease of life in WW1 as an answer to low-flying aircraft, and was employed in this role by the British as well as many other armies. It soon became obvious that the low velocity of the 1 PR was a handicap in dealing with aircraft, so more powerful versions were developed. Vickers, who made Maxim guns, produced first the 1¼ PDR and then the 1½ PDR Mk 1 naval guns, both firing a much more powerful 37x123R cartridge (the 1¼ PDR was loaded with the shells from the 1 PR, the 1½ PDR had heavier shells). These saw very little use, however, before being replaced by the 2 PR No.1, basically the same but with the case necked out and extended to 40x158R. Although primarily designed for naval use, it was employed in land service as well during WW1. Attention was also given to fitting cannon to aircraft, either for attacking other aircraft (including airships), ground targets, ships or submarines. The French were the leaders in this field, but the British also made many experiments, a few of which saw limited service in WW1. The 1 PR Maxim was too heavy for an aircraft to carry, so Vickers developed a smaller and lighter version, the 1 PR Mk III. This fired a shorter and less powerful 37x69R cartridge which enabled the gun weight to be kept down, but it saw little use. Right: 40mm Crayford (top) and 1½ PR COW gun - shown upside down! 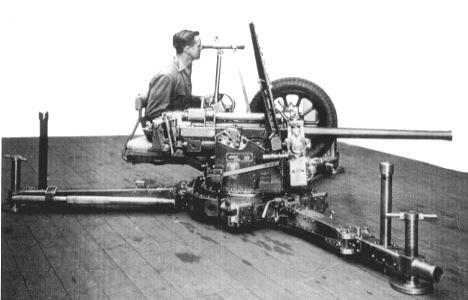 A more famous automatic aircraft gun was the Coventry Ordnance Works ("COW") gun. The first version of this was a 1 PR, firing a rimless 37x94 cartridge, but this was soon replaced by a 1½ PR version (37x190) which saw continuous development throughout WW1. It was at last ready for production just as the war ended, so few were built and only two entered service before the Armistice, in DH 4s. It fired at about 90 rpm from a five-round clip. Manually-loaded cannon were also tried. In fact, the first cannon installed in a British aircraft was a Vickers 1½ PDR Class B, which was experimentally fitted to a pair of seaplanes. The smallest and lightest was the 1.59" Vickers-Crayford Gun which was developed as a lightweight gun (21 kg for the bare ordnance, 41 kg including mounting stock and yoke-pintle as shown), both for aircraft and to provide infantrymen with more firepower in the trenches. It was popularly dubbed the 'rocket gun' apparently due to a misunderstanding (much to the confusion of armament historians ever since) but was in fact a conventional artillery piece. It fired a 540g HE shell at about 240 m/s, using a cartridge based on the naval 2 PR shell case, reduced in length from 158 to 79mm. A higher-pressure AP loading achieved 300 m/s. It was entirely manual in its action (i.e. without even the automatic ejection of the fired cases) and thereby very slow to reload, so it was not popular. A larger and more powerful weapon, the 2 PR Mk V, used a 40x240R cartridge but only two guns were ordered and a small quantity of ammunition made. (Above, left to right): 1 PR Maxim HE (37x94R), Vickers 1 PR Mk III HE (37x69R), Vickers-Crayford 1.59" AP (40x79R), 1½ PR COW gun HE (37x190), Vickers 1½ PDR HE(37x123R), Vickers 2 PR No.1 SAP (40x158R), Vickers 2 PR Mk V HE (40x240R). Note that the 1 PR Mk III and the 2 PR Mk V shells are both fitted with the sensitive No.131 fuze, intended to detonate on impact with fabric. The 40mm calibre was also used in the smallest of the WW1 American Davis recoilless guns which were fitted to a few aircraft. 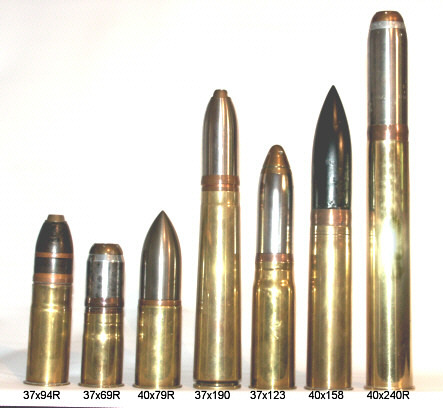 The 40x378R cartridge fired a 0.9 kg shell at 365 m/s and weighed only 24 kg, but was cumbersome to handle and reload. The backblast was also heavy enough to damage the fragile aircraft of the day unless it was aimed well clear, so despite many experiments and some service use it was never popular. See THIS article for more about WW1 aircraft cannon. One item which frequently causes some uncertainty is a shortened version of the usual 2 PR No.1 (40 x 158R) case, with a length of just 107mm. The photo below left shows both cases, together with a WW1-era time-fuzed HE shell. The headstamp (below right) is overstamped, clearly showing that the shorter case has been converted from the 2 PR No.1. The letters "HA" can just be made out. 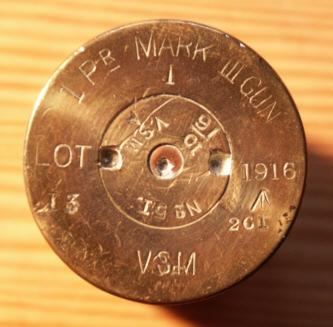 The origin of this cartridge lies in a sub-calibre training gun. 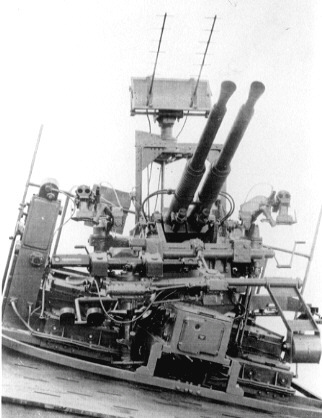 There were two manually-loaded sub-calibre 2 PR guns, designated Low Angle and High Angle (LA and HA). They were designed to fit within the barrel of 4" and 4.7" naval guns to provide economical practice, and used the breech mechanism of the parent guns. 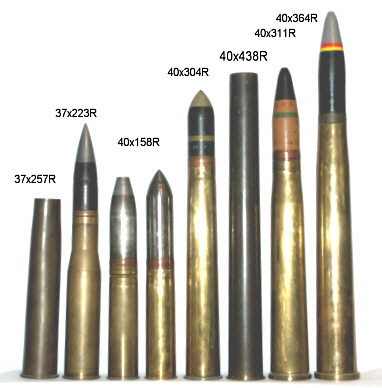 The LA used the standard 40x158R ammunition, the HA the 40x107R. They both fired the same projectiles, but the muzzle velocity of the HA was only 1,100-1,200 fps (c.360 m/s) instead of 1,900-2,040 fps (c.600 m/s) for the LA. The HA was presumably used in the anti-aircraft versions of the 4" and 4.7" guns, whose mountings achieved a higher elevation angle, with the lower velocity being chosen to minimise the range and therefore the range safety requirements. Between the wars the need was recognised to equip warships with automatic cannon in response to the growing threat of attack by aircraft. 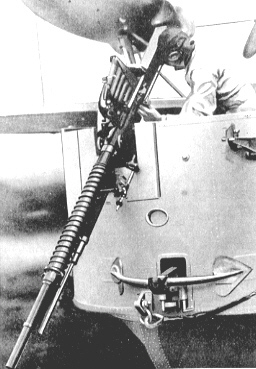 The Navy not surprisingly selected the belt-fed, water-cooled 2 PR already available and fitted it in a variety of mountings, from single manually-operated versions weighing around 1½ tons to the huge 20-ton eight-barrelled 'Chicago Pianos' fitted to various major warships in the late 1930s. The first developed was the eight-barrel mounting, for fitting to capital ships. The four-barrel followed, mainly for cruisers and destroyers. Single barrel mountings became popular later, particularly for fitting to Oerlikon mountings to increase firepower for dealing with kamikaze attacks. The gun originally fired a shell weighing 0.9 kg (two pounds) at a muzzle velocity of about 610 m/s but just before the war the disadvantage of such a low velocity was recognised and a high-velocity loading, firing a 0.77 kg shell at a still modest 730 m/s, was introduced. This can be recognised by the flat-nose contact fuze, rather than the round-nosed time fuze fitted to earlier shells. At about the same time the rate of fire was increased from 90 to 115 rpm. The weapon was sturdy but prone to jamming for a variety of reasons and needed a well-trained crew to get the best from it. These problems together with the relatively low performance led to its gradual replacement as the much superior Bofors gun became available, although it was still widely used at the end of the war and remained in service for some years thereafter. 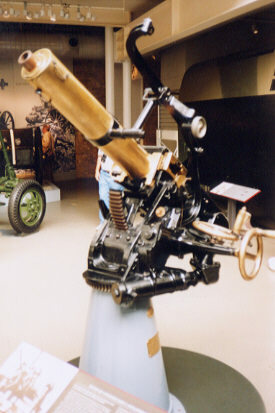 In the 1930s a small number of 2 PR was acquired by the British Army as a stop-gap AA weapon (in a twin-barrel fixed mounting) before the Bofors gun was adopted, but these were eventually given to the Navy. The 1½ PR COW gun was the other survivor of WW1, being tried in a variety of aircraft, mostly flying boats but also fighters. However, it never progressed beyond experimental status and the survivors ended their days as airfield defence guns in WW2. Its significance lies primarily in the fact that it was used as the basis for the design of the Vickers 40mm Class S described below, following Vickers' acquisition of the Coventry Ordnance Works. The LA and HA sub-calibre training guns were also put to more warlike use. 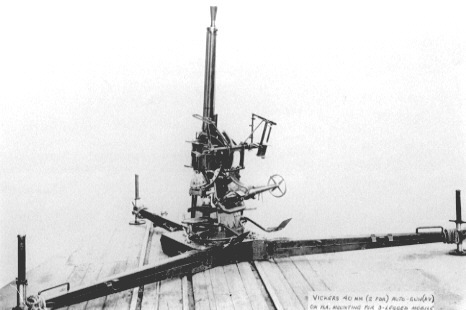 They were fitted with a percussion breech mechanism (still manually loaded) and had a dual-purpose mounting designed, capable of taking either gun (shown right). These weapons were designated the 2 pr Mk XI (HA) and Mk XII (LA) respectively. The Mk XI had a 25 calibre-length barrel, while the Mk XII had a 40-calibre. 180 Mk XI and 170 Mk XII guns were produced and fitted to HDMLs (Harbour Defence Motor Launches) and other small auxiliaries. 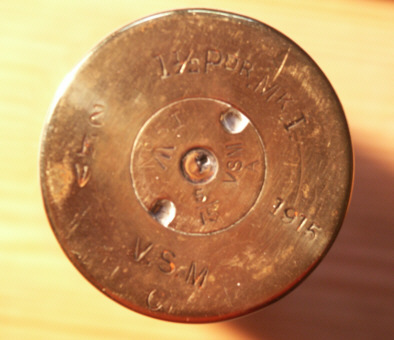 Case shot was provided as well more conventional ammo, at least for the HA. During the 1930s the machine gun was regarded as the main tank weapon against troops; the cannon was required only to deal with opposing tanks. It was therefore logical to fit a cannon which would give the best anti-tank performance. This meant a relatively small calibre, firing solid shot at a high velocity in order to improve the chance of hitting and achieve effective armour penetration. No use was foreseen for high explosive shells. This reasoning led to the adoption in 1936 of the 2 PR No.2 gun as the standard tank as well as anti-tank weapon, replacing the 3 PR (47mm) gun of the interwar Vickers Medium tank. 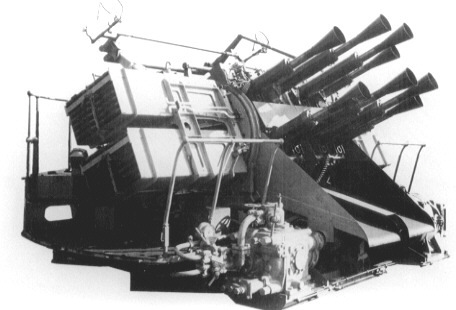 The 40x304R No.2 case had a much higher performance than the naval weapon, firing a 1.09 kg solid shot at 850 m/s, later replaced by a 1.22 kg capped shot at 790 m/s. 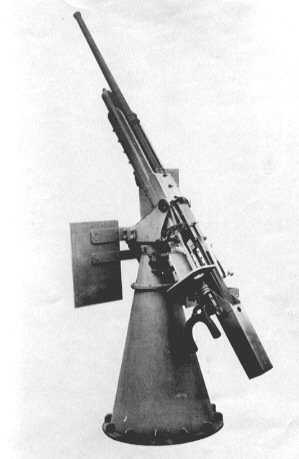 There is no doubt that the 2 PR No.2 was a very effective anti-tank gun when it was introduced. The larger calibre, with its correspondingly larger case, gave armour-piercing performance well above that of most 37mm guns; penetration of 53mm or armour plate at 60 degrees at 450m was achieved, compared with 30mm for the contemporary German 37mm weapon. The main drawback of the British gun was its weight of 800 kg, complexity (to achieve all-round traverse) and therefore cost. As a tank gun it was unsatisfactory because of the lack of an HE shell to deal with enemy anti-tank gunners (one was developed but hardly used), although one was eventually issued rather late in its useful life. In both applications, increasing tank armour thickness soon made it obsolescent and it remained in front-line service for far too long before being replaced by a high-velocity 6 PR 7 cwt from 1942. In fairness, the 2 PR remained useful in the Far East against the thinly armoured Japanese tanks and also enjoyed a more successful life as an armoured car and light tank weapon. In the latter application, its armour-piercing performance was boosted in 1943 by the addition of the Littlejohn squeezebore adaptor. This was designed by a Czechoslovak called Janecek (Littlejohn in English) and consisted of an attachment screwed onto the muzzle which squeezed specially designed 0.45 kg tungsten-cored skirted shot down to about 33mm calibre, increasing the muzzle velocity to 1,280 m/s and the armour penetration to 88mm at 450m. The Mk II version used a heavier and more aerodynamic shot at a lower velocity. The result was a precursor of the armour-piercing discarding sabot (APDS) tank ammunition, but it had the significant disadvantage that HE shells could not be fired unless the adaptor was unscrewed; not always practical in the heat of battle! There is more detail on the Littlejohn shot HERE. The final line of this development was the 2 PDR 'Pipsqueak', a gun initially intended as the main armament for the postwar Saladin armoured car. 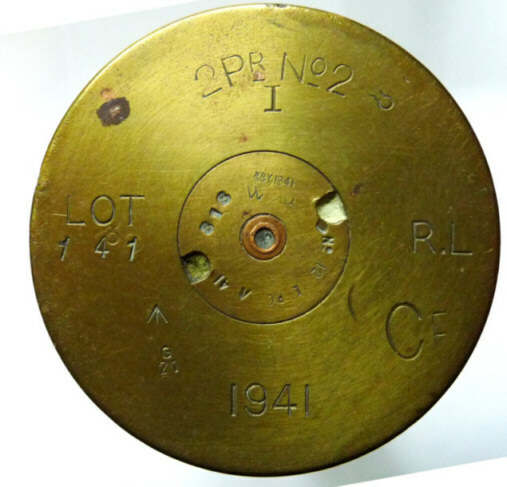 A factory drawing has emerged of this round of ammunition, showing that the cartridge case was the long (40x438R) 2 PDR HV (see headstamp on the right). This was designed to fire APDS rounds which would match the penetration of the 'Littlejohn' shot while still allowing HE shells to be fired. In fact the claimed performance was better, the 1,295 m/s shot penetrating 85mm of armour at 60 degrees at 900m. However, the factory drawing shows an APDS projectile weight at a very high 2,010 grammes, which cannot belong with the 1,295 m/s muzzle velocity, as the resulting muzzle energy would be far too high. 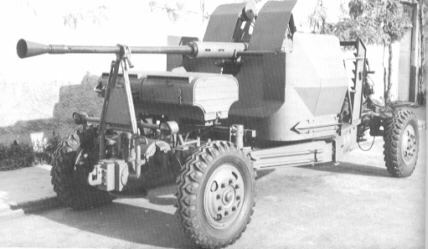 Pipsqueak was abandoned when a low-velocity 76mm cannon was selected instead, indicating a shift in role towards infantry fire support. Ironically, the specification is reflected in modern trends towards 30-50mm guns, firing sub-calibre armour piercing projectiles, for light AFVs. There were two different foreign-made weapons used by the British Army, both in 37mm calibre. One was the Bofors 37mm anti-tank gun (firing a 37x257R cartridge), probably acquired to make up for the initial shortfall in 2 PR guns after Dunkirk. It was used in North Africa, often carried "portee" on the back of a vehicle. Performance was modest. The other was the 37mm gun as fitted to US light tanks and armoured cars. There were two versions, both firing 37x223R ammunition; the M5 gun which had a slightly shorter barrel (thereby generating a slightly lower muzzle velocity) which was replaced by the M6 gun in November 1940. Armour penetration in the M6 gun at 460m and 70 degrees impact was 53mm against face-hardened plate and 61mm against homogenous plate. The importance of being able to destroy tanks from the air became obvious. Bombs were not sufficiently accurate, so thoughts turned to large-calibre guns. The naval 2 PR No.1 cartridge had already been selected as the basis for an airborne bomber defence gun which had actually been fitted to a much-modified Wellington bomber. The RAF therefore decided to adapt the gun for anti-tank purposes. The reason that the naval cartridge was chosen rather than the army's 2 PR No.2 was that the lower power reduced recoil and led to a smaller and much lighter gun. The lower velocity was considered acceptable as the aircraft would be firing at very short range. Special loadings were developed for the case, the standard AP shot weighing 1.13 kg and capable of defeating armour plate about 50mm thick at 360m (although the normal attack range was considerably less than this). 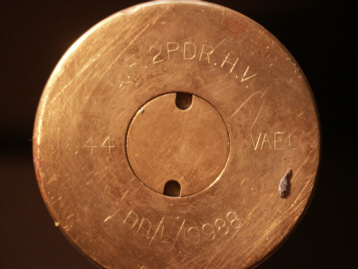 A 1.36 kg shot was introduced in 1942, improving penetration by 9%. Cannon were developed by both Vickers and Rolls-Royce using the same ammunition, but the Vickers 'Class S' gun (right) was much more successful than the R-R BH gun and was the only type used in combat by the RAF. The gun weighed 134 kg, was 297cm long and fired at a cyclic rate of 100 rpm. Two of these cannon, each with a 15 round drum magazine (although only 12 rounds were generally loaded in the interests of reliability) and with a .303" Browning used for sighting, were fitted to the Hawker Hurricane lID 'tank buster' which saw most of its use in the Western Desert with No. 6 Squadron between May 1942 and May 1943, with some use in the Far East later in the war. The system proved highly accurate, much more so than the rockets which replaced it, but was withdrawn from N. Africa because the aircraft were too vulnerable to ground fire (39 were lost to flak) and the gun was incapable of dealing with the Tiger tank. Many of the more powerful and better armoured Hurricane IV were also equipped with this gun as an alternative to the rocket projectiles, and some of these saw service in the UK, attacking targets in France and coastal traffic until March 1944 when they were finally withdrawn. More information about WW2 airborne anti-tank guns can be found HERE. 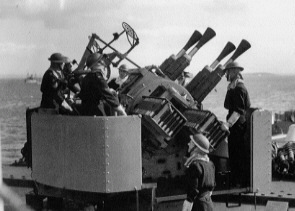 A manually-loaded version of the Rolls-Royce BH aircraft gun, the BD, was used by the Royal Navy which ordered 1200 of them to equip coastal craft. They weighed 320 kg including the mounting. Unfortunately they proved unsatisfactory and were replaced by the 6 PR Molins gun as soon as possible. The Swedish firm of Bofors started developing its famous 40mm anti-aircraft gun in the late 1920s at the request of the Swedish Navy. The first production version emerged in 1932 and immediately attracted international interest because of its combination of a high performance cartridge with a high and reliable rate of fire. 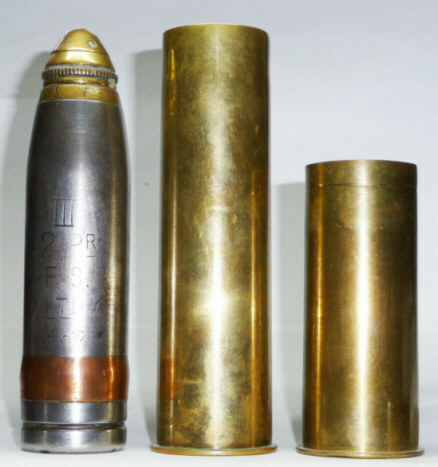 The cartridge case, at 311mm long, is marginally longer and also wider than the contemporary Army 2 PR No.2 and fired a 0.9 kg shell at 880 m/s. The gun, which weighed around 2 tons on its carriage (1.2 tons in naval service) achieved a cyclic rate of 120-140 rounds per minute, depending on the elevation. The gun was adopted by the British Army in 1937 as its standard light AA weapon in a single-barrelled, air-cooled version. It was a great success and demand exceeded production until 1943. The quality of the gun was such that the Royal Navy also started fitting it to ships in 1941, before adopting a purpose-designed twin-barrelled water-cooled version, first used in late 1942. The extra performance over the Navy's 2 PR meant that attacking aircraft could be engaged at a significantly longer range. Several different mountings were used, the ultimate being the six-barrelled radar-directed 21-ton weapon fitted to the postwar battleship HMS Vanguard. 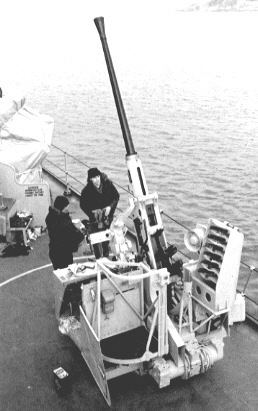 The Bofors gun was still in use by the RN into the 1990s, in a single barrelled air-cooled version, although it was gradually phased out in favour of 30mm guns. After the war, Bristol developed a new mounting for the Bofors which had a heavier carriage including a generator to provide powered elevation and traverse. The gun was controlled by a joystick and aimed by a gyro-stabilised computing sight. This modification, known as the Bristol Bofors, was adopted for service around 1950 but was rapidly overtaken by Bofors' own development, the L/70. 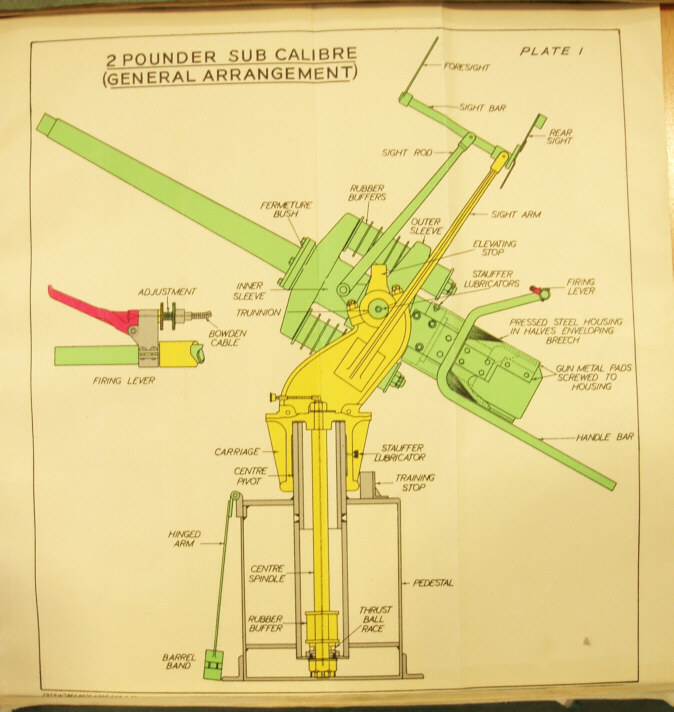 The original Bofors gun had a barrel 56 times longer than the calibre and was therefore known as the L/56, although this version is now usually referred to as the L/60. In the late 1940s, Bofors developed an improved gun with a longer (L/70) barrel firing a larger (364mm long case) cartridge in order to increase the muzzle velocity to 1,020 m/s. At the same time the mechanism was altered to increase the rate of fire to 240-300 rpm, and power operation was introduced. The gun was promptly ordered by the British Army to replace the Bristol Bofors and remained in service from 1953 until its replacement by the Rapier missile in 1979. Although the Royal Navy had many plans to acquire the L/70, it never did so, the L/60 remaining in service to the end. 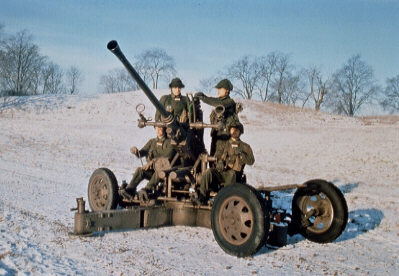 Despite the age of the basic design, the Bofors 40mm L/70 remains a highly competitive weapon, still in production in a range of versions (including the licence-produced Italian Breda 'Fast Forty' with the firing rate increased to 450 rpm) and used in a number of applications including land-based AA systems, a turret-mounted gun for light armoured fighting vehicles and in naval anti-aircraft/anti-missile single and twin barrelled systems. None of these, however, has been or is likely to be adopted by the British armed forces. There is more information about Bofors automatic guns HERE. The only weapons in these calibres now in British service are riot guns and grenade launchers. However, the 40CT has recently been selected as the next light AFV gun for fitting to rearmed Warrior IFVs and FRES Scout, so the story isn't over yet! Bofors 37mm anti-tank gun case (37x257R), American 37mm tank gun APC (37x223R), Vickers 2 PR No.1 HV (40x158R), 40mm Class S gun AP (40x158R), 2 PR No.2 tank/anti-tank AP Mk 1 (40x304R), 2 PDR HV ("Pipsqueak") case (40x438R), 40mm Bofors L/60 (40x311R), 40mm Bofors L/70 (40x364R). * The APDS projectile weight and the muzzle velocity come from different sources and cannot belong together, as the resulting muzzle energy is far too high. The 2,010 gram weight is taken from a factory drawing, the 1,295 m/s is quoted in a source on the Pipsqueak round. The assistance of the Custodian and staff of the Ministry of Defence Pattern Room, Nottingham, is gratefully acknowledged. Thanks are also due to John Carlin for the loan of his (rare) 1½ PDR Vickers, (extremely rare) 2 PR Mk V and (almost unheard-of) 2 PDR HV "Pipsqueak" rounds.